Introduction: Derrick Savage, who worked in the engineering development lab at the Submarine Systems division of Standard Telephones and Cables Ltd from 1979 until 2001, sends these photographs of early submarine cable repeaters. 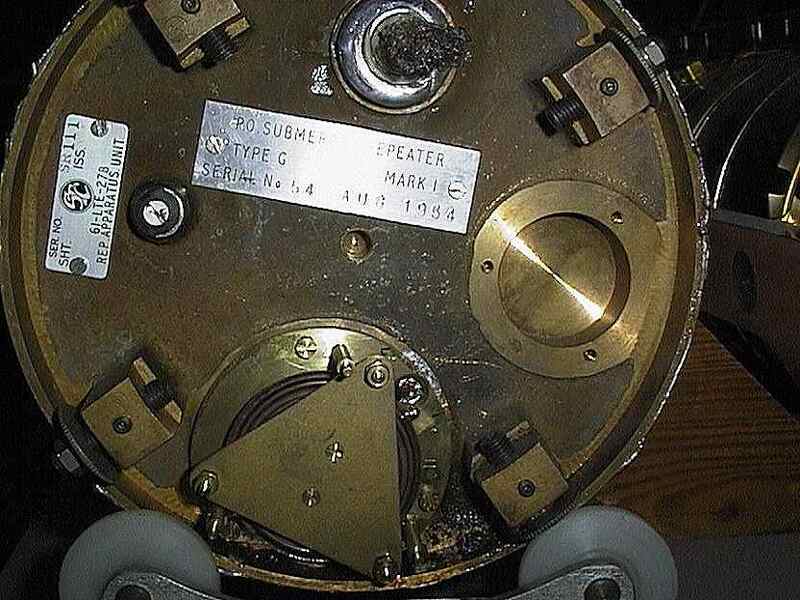 The repeaters were made in 1954 according to the nameplates, and were recovered from a system which had been laid somewhere in the far east. One part of the assembly which is at present a mystery is a component attached to the end casting of the internal frame. The part consists of a pressure capsule which is attached to the 'I' of an 'E' & 'I' Mullard feroxcube ferrite coil assembly. Closer inspection shows a gap between the 'E' & 'I'. There is a single coil wound on the 'E' and the ends of the coil pass into the main assembly of the repeater. When a repeater is laid in the deep sea the pressure inside the sea case should remain constant at 1 atmosphere. 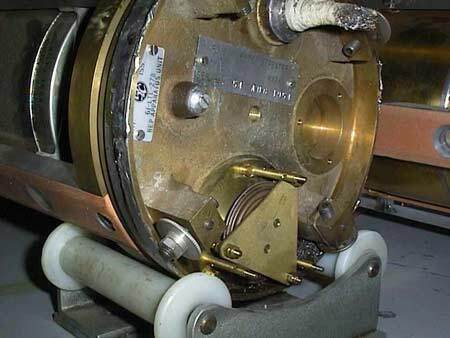 Unfortunately, with the extreme external sea pressure and, dependent much on where it is laid, electrolytically generated hydrogen will ingress into the repeater case via the cable. 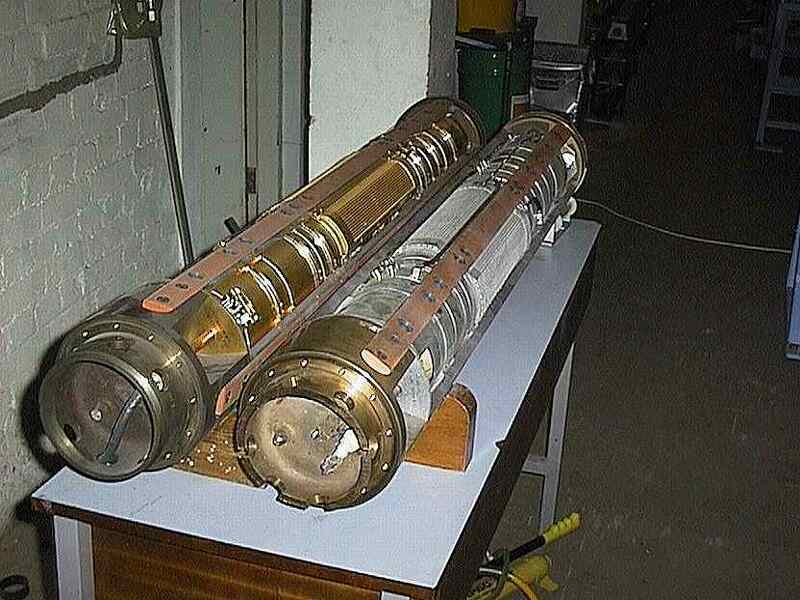 Hydrogen has been an enemy to undersea repeatered systems from the beginning, right up to the present day optical fibre systems. Hydrogen is known to ingress into and degrade electronic components and even into the glass fibre we use now. The absorption of hydrogen into glass fibre puts a loss at the very worst place—very close to the zero dispersion wavelength of 1300 Nm. 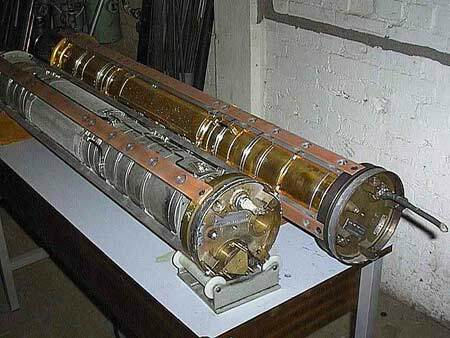 So, was the coil of the mystery component mentioned above incorporated as an inductive element of an oscillator? The gap left on the ferrite assembly will change as a function of sea case pressure variations if hydrogen is ingressing into the case. The variation of gap in the ferrite magnetic path will change the inductance of the coil and if incorporated in an oscillator will change its frequency. Therefore by pre-calibrating in a pressure chamber by plotting frequency change against pressure change, the arrangement can be used as a pressure sensor in a repeater sea case. These repeaters used thermionic valves as an amplifying element so profligate use of additional valves for sensing purposes would be resisted as far as possible. However repeater supervisory communication was designed into these repeaters to indicate the repeater status back to the terminal buildings on shore. The overall views of the repeater are followed by detail photographs showing the pressure capsule and its adjacent assembly. 2013 update: Subsequent to the publication of this page, Peter Davies was able to provide information on the function of the component, and it is no longer a mystery. A detailed explanation appears after the photographs. 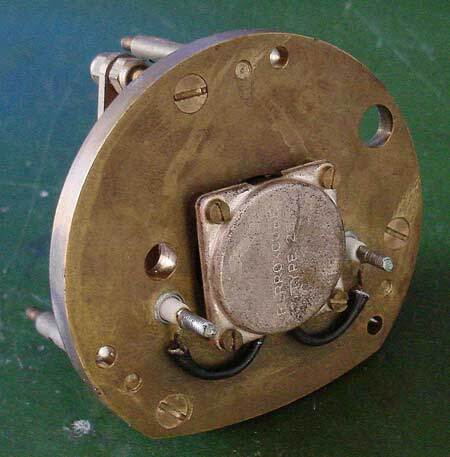 The function of this component is confidence testing of the repeater pressure housing. It was used only at the manufacturing stage. A capsule of metallic calcium was incorporated and open to the atmosphere in the repeater housing. 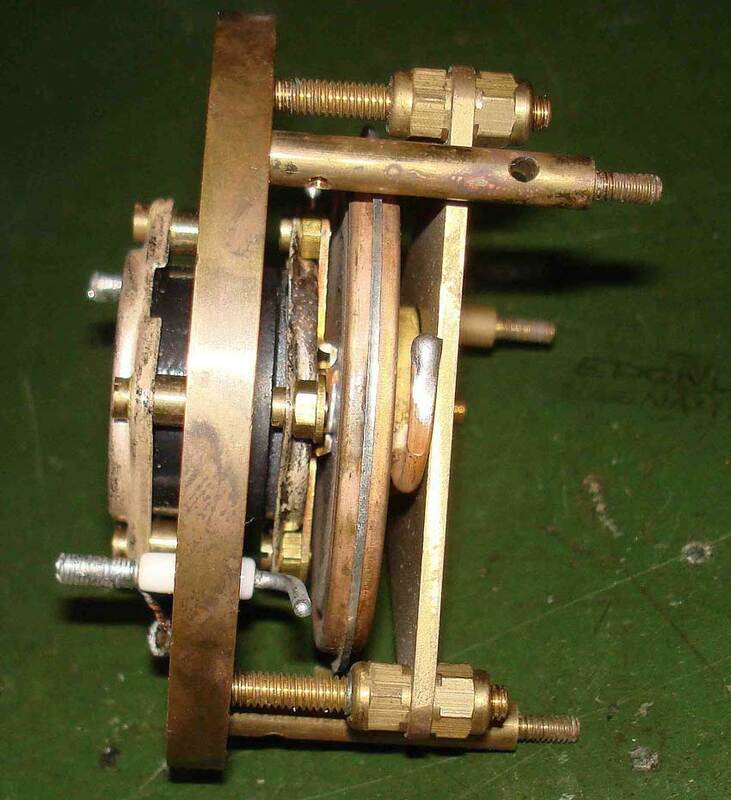 During pressure testing of the repeater, any water or water vapour ingressing into the housing would generate hydrogen when in contact with the metallic calcium, thereby raising the pressure in the housing. Hence the need for a pressure sensing capsule in the sensing device. I can now see the purpose of the ferroxcube coil assembly. Another component required for the sensing system was an electronic oscillator generating a tone centred on a frequency of 1.3 Mhz. 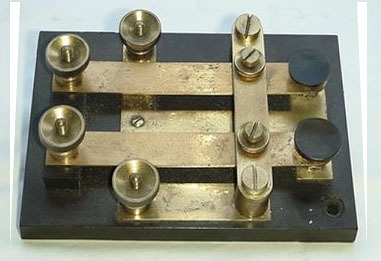 The first component of the tone generator was an inductance wound on an 'E' & 'I' ferrite cored coil and is the only electronic component in the 'mystery device' . 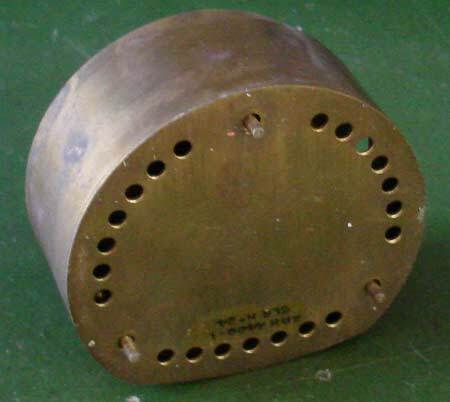 The 'I' part of the core is attached to the pressure sensing capsule and is spaced away from the 'E' part by a small gap. A rise in the housing pressure would depress the capsule and increase the gap between the 'E' & 'I', thereby raising the frequency of the oscillator. It would be possible to calibrate change of frequency against change of pressure, but I suspect that a change of pressure of any description was enough of an indication. The pressure sensing circuit shunted the 'B' end entry of the co-axial cable and if left in place would present both shunt and return loss because it would change the characteristic terminating impedance of the coaxial cable of 55 ohms. 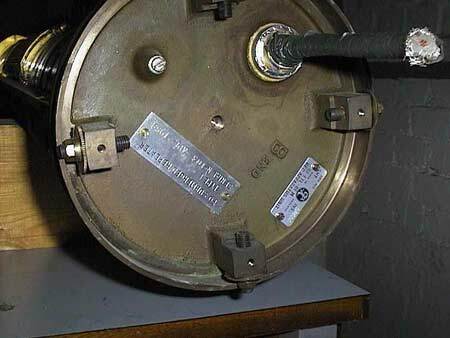 To ensure this didn't happen a fuse link was incorporated in series with the pressure sensing circuit directly attached to the 'B' end co-axial cable. The other end capacitively coupled to the sensing circuit oscillator. After a satisfactory pressure test, an electrical pulse was applied from a relatively low impedance souce to the 'B' end co-axial cable input that blew the fuse link remotely. This removed the sensing circuit shunt impedance, thereby restoring the 55 ohms cable impedance.